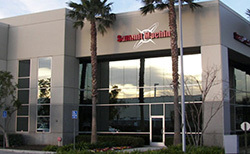 Summit Machine, LLC specializes in the rough and finish machining of complex components for the aerospace, commercial, defense, power generation, space and petroleum industries. Our expertise is machining nickel based alloys like inconel 625, 718, waspaloy, thermospan, as well as titanium, stainless steel, and aluminum. Incorporated in 2003, Summit Machine, LLC has grown to over 130 employees today operating 48 CNC Lathes/VTL’s and 10 CNC milling centers. Machined components range from 2.0″ OD up to 100″ OD. Our dramatic growth is driven by a dedicated workforce committed to producing a competitive quality product and meeting customer delivery schedules. We have over 100,000 sq. ft. of manufacturing space to better serve our customers and allow for further expansion. The shop operates six days per week, twenty four hours per day, to get the job done. Summit Machine, LLC has a strong engineering and metallurgical staff to assist in designing the most optimum shape for machining and processing. Our engineering staff uses UGS NX, SolidWorks, VeriCut, TransMagic and Procam software. All standard formats can be converted including DXF, DWG, IGES and STEP, among others. This facilitates the ability to program from a customer supplied model, manufacture the part and then inspect to the same model using Mitutoyo Mcosmos or PCdmis CAD++ software. Our mission is to set the standard for quality and value in complex machining. Forward your next machining requirements and let us show you the Summit difference.